You can fill in your own divorce forms. With their eyes on saving money and minimizing sorrow, more and more couples are asking: "How do I file my own divorce?" If both parties are willing and able to work together, self-filing can be one of the easiest ways to end an unhappy marriage. The mere thought of divorce can send everyone involved into a tailspin. Not only is divorce an emotionally-crippling event in most cases, but the intimidating amount of legal minutiae surrounding the event can send even the most intrepid person running for cover. Fortunately, modern times call for modern solutions and the vast amount of information available to the public helps to shine a comforting light on areas that once were sheathed in darkness and fear. Court systems all over America suffer from overscheduling, so if you are interested in a faster and cheaper divorce, filing the papers yourself can greatly expedite the process. If you're still feeling overwhelmed, use the following sections as a step-by-step guideline for filing for your own divorce. This is also a good time to decide if one party will file the divorce or if you'll file jointly. If you can get through this discussion with most of the issues agreed upon, you can most likely file your own divorce successfully. 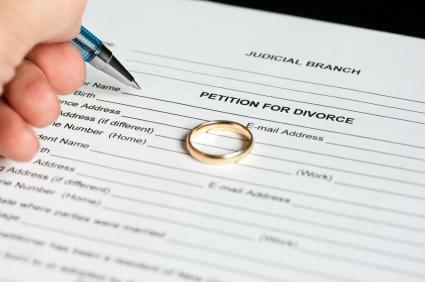 There are several ways to go about acquiring the necessary forms for divorce. If money is an issue, the resources in this section provide low or no-cost paperwork to download and print yourself. Free Divorce Forms: Upon entering the site you'll see a map of the United States. Clicking on your state will take you to that state's page where you can download the proper forms. Once there, search for links for court forms, domestic relations forms or self service center. FindLaw: This site offers a directory of divorce forms for all 50 state. You can also purchase customized forms for your state if you prefer. Rocket Lawyer: This web page offers a variety of forms, including ones for a separation agreement, a divorce worksheet and a divorce settlement. The site also has a business specialist on hand to help answer your questions. Your final task before the completion and filing of the paperwork is to consult with your county or borough's court clerk. She can explain the filing fees, the number of copies to make, where to file the petition and any other requirements specific to your state and your situation. Now that you've prepared yourself, you and your spouse can now sit down and fill out the forms. Doing this together ensures that you are both on the same page regarding every aspect of the divorce and can help avoid any problems that may arise after the fact. Once this step has been completed, file the divorce petition with the court clerk in your county. After a state-mandated waiting period, the court system takes over and will issue your divorce decree in due course, barring any complications. While it's true that a self-filed divorce can be a relatively painless event, never assume that yours will go off without a hitch. Prepare yourself for complications and be ready to seek legal counsel should the need arise.